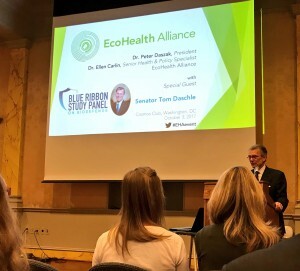 This past week I had the opportunity to see past Senate Majority Leader Tom Daschle speak as a part of the Blue Ribbon Panel on BioDefense (BRPB). The BRPB began in 2014 as a privately funded, bipartisan, entity with panel members composted of former Representatives, Senators, and Governors among other high ranking federal positions. The goal of the panel was to evaluate the ability of the United States to prevent, detect, and respond to biological outbreaks, whether they be natural or by way of bio-terrorism. Their findings suggested that the United State is woefully unprepared to detect bio-threats in a timely manner nor to appropriately respond to such threats. Their conclusions reveal the underappreciated fragility of the American economy and nuanced ramifications faced by Americans due to foreign pathogens causing disease outbreaks. The AVMA, alongside several veterinary and agricultural-trade organizations, have recognized this insufficiency in American agri-defense for many years and have recently bolstered their pressure on the federal government to establish a national animal vaccine bank with a priority on Foot and Mouth Disease (FMD) to protect American livestock. Speaking purely from a monetary standpoint, creating a vaccine bank is more than worth the expense. Consider this: the current ask of the federal government is 750 million dollars for the establishment of the vaccine bank and coordination of vaccine production. Compare that to the 34.5 billion dollars the United Kingdom economy lost due to the islands FMD outbreak back in 2001. If an outbreak in the UK can disrupt an economy to that scale, it is hard to put in perspective what could happen to the US. Despite this strong argument, there is many more aspects to this discussion than purely maintaining economic stability. As I mentioned previously, there are many nuances to a disease outbreak that are hard to account for. As a veterinary student having worked with those in the agricultural sector for many years, the concern that I have from an outbreak is not the cost to the American economy, but the direct impact on animals and those that care for them. Without the ability to manage disease outbreaks with vaccination, we are left with depopulation; the approach taken by the UK in 2001 and found to be devastating. When managed depopulation is carried out, farmers are forced to go against everything they’ve ever learned and worked for. While they may be compensated to a certain extent by the federal government for losses, the reimbursement will never make up for the true costs of such an undertaking, such as years of on farm genetic selection, young and growing stock’s future potential, and an abrupt cessation of likely their only income for a long period of time. This significant loss of livelihood would be the end of the road for many of our countries small family farms. And more difficult even than this, many of these caregivers must face the reality of euthanizing their animals, their life’s work. Farmers and ranchers put their heart and soul into their animals. They are their lifeblood and such action would take an incalculable emotional tole.